Crawley Town hope to reveal the location of their new training ground next week. Head coach Dermot Drummy has pushed for a location within ten minutes of the Checkatrade Stadium so they can utilise the facilities there. He has opted to move closer to home than their base in Ardingly College last year, but will not compromise on quality. 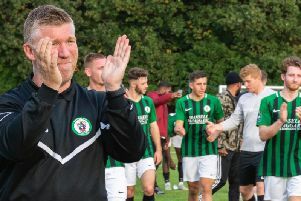 Reds have previously had spells training at Oakwood Football Club and at Bewbush and they are almost ready to put in an offer for the lease on a new local site. Drummy said: “We are really close to going down to look at one with Jim Richardson and his ground staff to see if irrigation works and it is feasible to put pitches on there and temporary buildings. “Once we have looked at that we can start to make an offer to get a lease on the training ground. We are really close, probably next week we can identify it. “What we need down there are decent pitches, end of. Then all the facilities are here. We take the physios down and there are cabins for toilets and covered areas to change. “That’s all we need with goals and an area and then we come back here for the analysis and rehab. If we can invest in ground here and make this up to spec, then the training ground is just football pitches. “If three years down the line, we are really doing well and can invest and buy a training ground, great. Reds have finalised two more pre-season friendlies with a clash at National League South side Aldershot Town (Saturday July, 30) and at Ryman League Lewes (Tuesday, July 26).